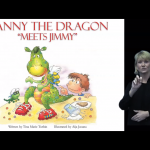 There are many emerging book applications for iPads, but this is one of the first that includes a special sign language version for deaf children. In addition it includes a version where it will read the book to you (audio), flip the pages for you, as well as show you the text that it is reading to you. 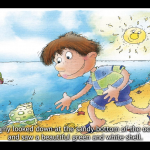 The book is a childrens book with large illustrations drawn by Aija Jasuna. The book was written by Tina Turbin and published by Imagination Publishing group. The app is $2.99 in the App Store and can be directly downloaded to an iPad. Click here to open it in the iTunes Store. Look below for screenshots. The text is signed to you in the form of a video. The text is shown and changes as it is read to you. This entry was posted in iPad App and tagged in Books, iPad App.